Liriope (lihr-rye-oh-pee) Lilyturf, monkey grass, border grass, blue lilyturf; Ruscaceae Family. Low growing perennials from Asia, Liriope and its species are often confused with, or used synonymously with, species of the related Ophiopogon genus. Often used as ground covers because of their heavy mat-like growth. 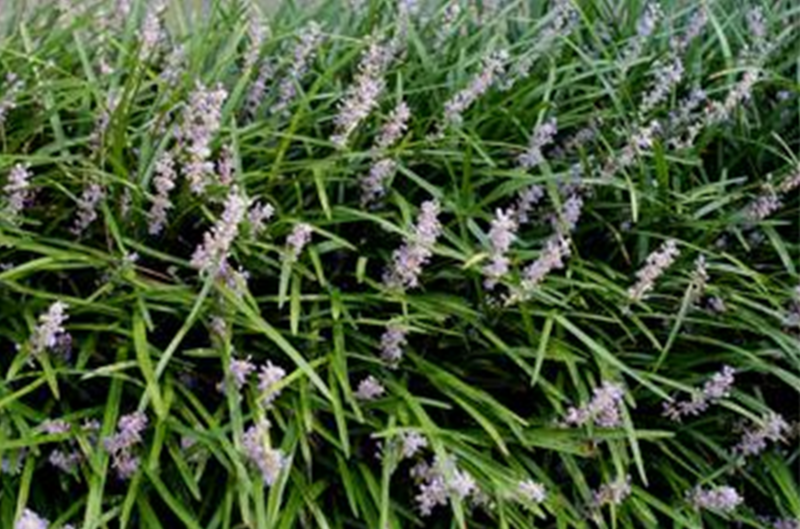 With grass-like leaves and profuse little lavender or white flowers, Liriope thrives in sun or shade in ordinary soil. Liriope tolerates some drought, some salt; will grow in moist soil, but prefers well-drained, loamy sandy or clay soils with a pH of acidic to alkaline; it is generally allergy free. This native of Eastern Asian forests will grow almost anywhere, in any conditions and is easily transplanted. Liriope muscari (musk-are-eye) blue lily turf. Leaves are 1 to 1 ½ feet long. Pretty clusters of lavender flowers on spikes are the same height as the grass-green leaves. Blooms in late summer. Liriope spicata (spy-kay-tuh or spi-kah-tuh) creeping lily turf. This native of Japan and China has a shallow root system, narrow leaves and blooms light lilac to almost white. One of the best groundcovers for erosion or weed control, even on the steepest hillsides, is Liriope spicata. If you can get it in the ground or put some dirt on the roots, it may spread aggressively by underground runners. Liriope muscari, the clumping liriope is almost as tough, but does not spread by runners. Easy care low maintenance border plant or ground cover in shady areas. Works well in containers. Deer resistant and drought tolerant. Space the plants about 1 foot apart when planting. Mow foliage at the highest possible cutting height in late winter before new growth.